Thursday, September 20, 2018 at Capitol Hill's sophisticated private event venue Block 41 — Fashion for Conservation (FFC) and Hoja Nueva will take dedicated fashionistas, nature lovers, and philanthropists on a walk through the world's jungles in high style. Hoja Nueva and FFC are back in Seattle to host the 4th annual rainforest runway and gala with proceeds protecting rainforests. Witness this exquisite evening of international art, fashion, and design inspired by the richly diverse rainforests of the world. Join us for an evening of diverse flavors and cultures, captivating sounds of the wild, and vibrant couture styles to save the largest unprotected rainforest in Peru — Las Piedras. Celebrate the diversity and unique stories of living in harmony with wildlife and their rainforest habitats. In previous seasons the gala has featured animal and rainforest-inspired collections from as many as 18 international designers, hosting between 500-800 guests, while making a significant impact to conserve rainforest in the Peruvian Amazon. This event can only host 300 guests, so RSVP today! Most recently, Fashion for Conservation and Hoja Nueva embarked on their first ever annual joint Amazon retreat together, bringing 24 guests from last season's Rainforest Runway including attendees and participants (ie. the model below) into to the heart of the Peruvian Amazon. 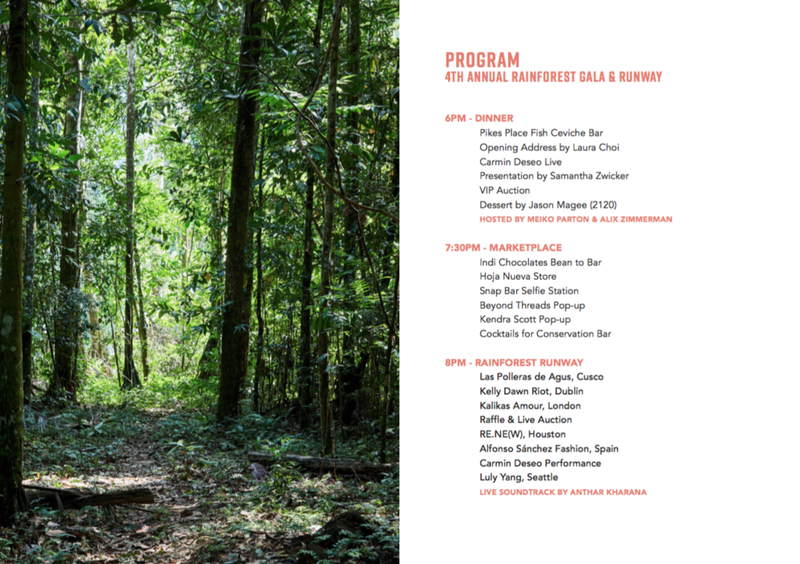 At Seattle's 4th Annual Rainforest Gala & Runway, this once in a lifetime jungle get-away for 2-4 will be live auctioned. Programming includes trips to see local wildlife, amazon waterfalls, cacao farms, custom jungle photoshoot with Fashion for Conservation's creative team, and more. Winners will have the exclusive privilege of staying at Hoja Nueva's two-story remote Amazon eco-lodge and conservation center, built in part with the funds raised from the first annual rainforest gala. Ready? Just follow the Rainforest Runway behind the scenes...back to the Amazon. The urgency of conserving the earth's rainforests now goes beyond cultural and wildlife preservation. Fragmented forests resulting from increased agriculture store less carbon and adversely impact wildlife movement and gene flow, resulting in higher levels of atmospheric carbon and regional species declines. As a component of the recent Paris Accord, slowing climate change by method of conserving rainforest is an urgent matter that requires strong institutional support for projects that shift how we source our food, water and energy. Protecting our last in-tact rainforests is now a matter of basic human survival. Hoja Nueva confronts deforestation in the Peruvian Amazon by conserving rainforest and building capacity within remote and indigenous communities by implementing rigorous scientific research in waste management, water and wildlife; and creating alternative income opportunities through sustainable agriculture and micro-finance programs that protect indigenous culture and wildlife habitats. "Thanks to our annual rainforest gala, our zero-carbon footprint two story eco-lodge has been built in the lowland Amazon rainforest along with 2000 trees to create a research center that provides conservation and agroforestry education in a world threatened by rampant deforestation and climate change...and so much more," states co-founder of Fashion for Conservation and Hoja Nueva director Samantha Zwicker. Mark your calendars for this wild event and anticipate a fantastic designer lineup! Tickets are extremely limited - get them before they're gone! Left to right: Featured designers inclusive of Kalikas Armour and Luly Yang. $15,000 toward expanding Hoja Nueva’s land by 150 acres to protect rainforest habitat for conservation. $10,000 to support the exciting start of Project ReWild, a program aimed at rehabilitating and reintroducing threatened animals to the wild. Funds will help construct the Khan Memorial Reintroduction Center for future cat species, and support the dwindling population of macaws using the installation of nests and the rescue of abandoned chicks. $3,000 to Fashion for Conservation’s e-commerce platform featuring accessibly priced sustainable clothing that is produced and embroidered in conjunction with the indigenous migrant women of Peru. For more information or to get involved, reach out to Samantha Zwicker of Hoja Nueva (sjzwicker@hojanueva.org), or Laura Choi of Fashion for Conservation (laura1choi@gmail.com).